Perimeter LED lighting. Now with 128 standard LEDs, with 52 additional DIY positions for 180 total possible LEDs. Prepare to meet the bleeding edge of keyboard mount technology. 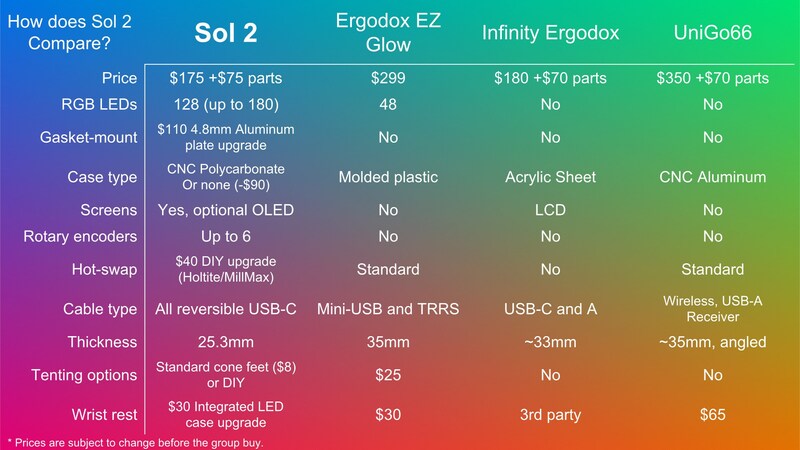 Sol 2 is available with a 4.8mm thick, anodized aluminum plate. This plate and the PCB are entirely suspended by Buna-N rubber O-rings. The rubber is compressed, providing a strong build with slightly damped bottom-out feel and sound. The rigidity of this mount can be adjusted to your liking by replacing the rings with alternate hardness. These renders are not representations of color or finish. Prototype photos of the polycarbonate and aluminum (in each color) will be available before the group buy.